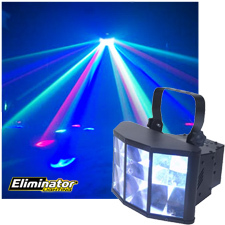 The LED Electro Ray is a powerful lighting effect for both clubs and mobile DJs. This effect light features 3 x 3W LEDs (1x Red, 1x Green, 1x Blue), 5 DMX channels and no duty cycle. The effect creates a dramatic cluster of multi-dichroic colored beams crisscrossing throughout the room. Due to its oval lens design, the coverage area is enormous. Weight: 6 lb. / 2.8 kg.